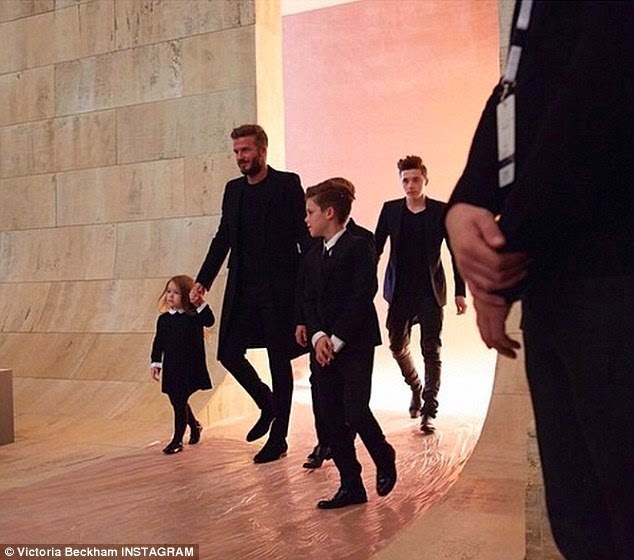 Victoria & David Beckham undeniably have one of the most beautiful celebrity marriages ever! It was one of the most important events of the New York Fashion Week calendar. But Vicky showed no sign of nerves as she arrived ahead of her Fall/Winter 2015 fashion show in the Big Apple on Sunday afternoon, where she was joined by her supportive family. 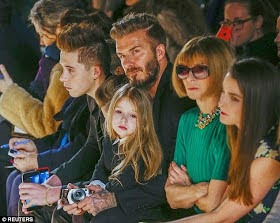 Her husband David and their four children Brooklyn, 15, Romeo 11, Cruz, 9 and three-year-old daughter Harper took pride of place in the front row at the catwalk presentation, where they were seated alongside Anna Wintour and her daughter Bee Shaffer. Fine family. Money really good, see as the children fresh like people wey them put inside fridge.